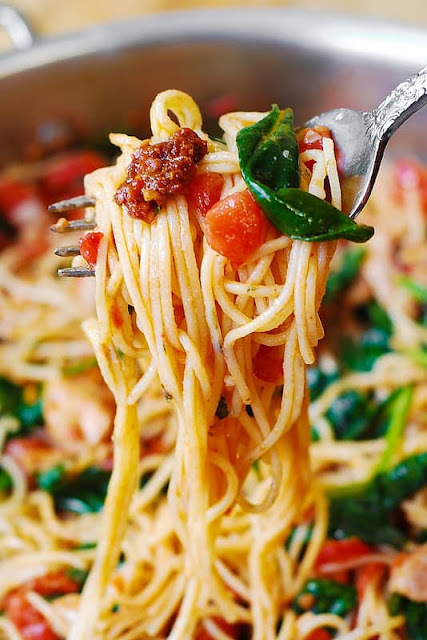 Tomato Spinach Chicken Spaghetti – this recipe features fresh tomatoes, sun-dried tomatoes, fresh basil, spinach, garlic, and olive oil. It’s a great Summer pasta recipe! Easy and delicious way to cook spaghetti using fresh vegetables and chicken! This chicken spaghetti recipe has lots of fresh ingredients: tomatoes and spinach, as well as comfort food ingredients, such as chicken. You'll love the flavors of this pasta! Add chopped sun-dried tomatoes and 2 tablespoons of olive oil, drained from sun-dried tomatoes, to a large skillet, on medium-low heat. Add chopped chicken (I used boneless skinless chicken thighs and prefer to use them, but you can use chopped chicken breast, as well), red pepper flakes, and salt over all of the ingredients in the skillet, and cook on medium heat until chicken is cooked through and no longer pink, about 5 minutes. 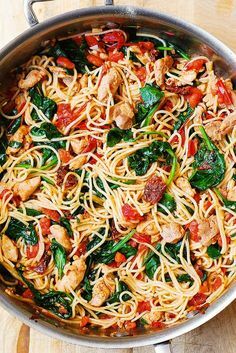 Add chopped tomatoes, chopped fresh basil leaves, fresh spinach, and chopped garlic to the skillet with chicken, cook on medium heat about 3- 5 minutes until spinach wilts just a little, and tomatoes release some of their juices. Remove from heat. Taste, and add more salt to taste, if needed. Cover with lid and keep off heat. Cook pasta according to package instructions, until al dente. Drain, and add cooked and drained pasta to the skillet with the chicken and vegetables. Reheat on low heat, mix everything well, add more seasonings (salt and pepper), if desired. Remove from heat. At this point, when the pasta and vegetables are off heat, you can add more high quality olive oil, which is really tasty. Or you can add more olive oil from the jar from the sun-dried tomatoes. 0 Response to "TOMATO SPINACH CHICKEN SPAGHETTI"